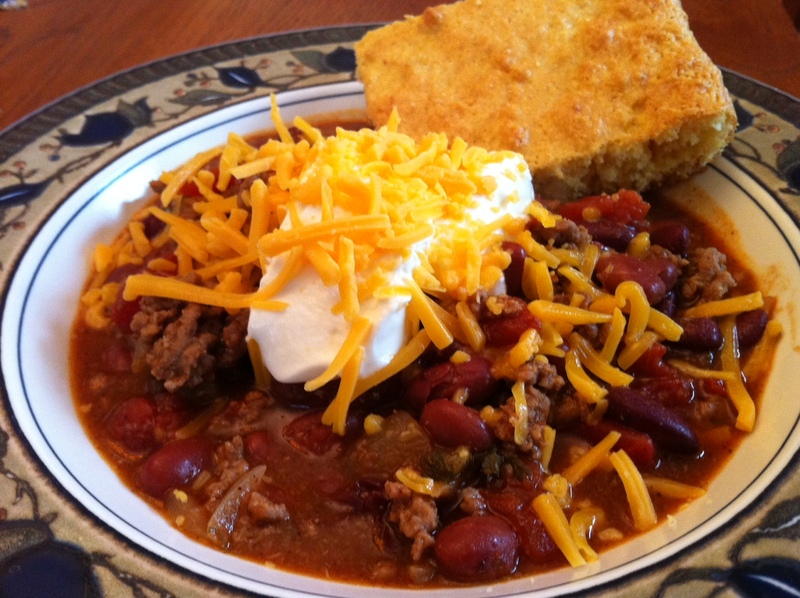 Today has been a dreary day, so what better way to warm the soul than with a piping hot bowl of homemade chili? As most of you know, Jon does a majority of the cooking, so when I set up camp in the kitchen, I opt for quick and easy. That’s not to say the results aren’t tasty, they simply aren’t as complex. This chili is no exception. You can whip up this flavorful meal in less than 30 minutes- from prep to bowl. In a large pot, place the ground beef and chopped onion. Turn heat to medium high and cook meat, stirring occasionally, until browned. Add the remaining ingredients, stir, reduce head to medium, cover and cook for 20 minutes. Serve immediately with sour cream and shredded cheddar. I tried something new with the cornbread. I used the Jiffy Cornbread mix and replaced the 1/3 cup of milk with 1/3 cup of creamed corned. The result was interesting- a crumblier bread, but oddly enough, it was packed with moisture. Yummm, I want to try this!